Dealing with audio files is a norm in a technologically advanced world. One needs to be knowledgeable for creating audio-visual presentations. Artists have to master the craft of handling them in order to make music. Good news! MP3 Toolkit, an all-in-one software, is the latest creation that will surely make life easier for newbies and junkies alike. Cuts MP3 files. Audio files are often cut for purposes like ring-tone making and the like. Some portions are not important, so these have to be removed to either save some memory or to be utilized for another output. MP3 Toolkit allows users to cut MP3 files with ease, so that the audio editing process is expedited. Records any sound. No matter what sound you want to capture, MP3 Toolkit is there to help you. All you need is a microphone, and your recording will automatically result to the standard MP3 format. Did I also mention that no time limitation is set? This means that you can record all you want! Supports countless formats. MP3 Toolkit is committed to being inclusive of users who have varying preferences when it comes to the formats they want to convert. Thus, the program offers more than 20 input formats and more than 10 output formats. 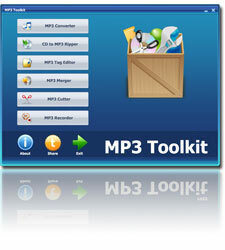 You can download the MP3 Toolkit software and try it immediately. Merges different audio files. Sometimes, we need several great parts of different audio files to create a masterpiece. That aim is no longer far-fetched because the MP3 Toolkit can cut and merge your favorite parts and make it into one single file. The most amazing thing is that you can accomplish this task with speed! Edits MP3 tag information. Tag information is crucial for organizing files. MP3 Toolkit helps users edit tag information in bulk. Apart from audio files, the software also offers editing of pictures and lyrics, a benefit that most offerings in the market today do not have. Rips CD to MP3. Have you ever loved a CD so much that you just wanted to save the content into a more modern format? If yes is your answer, MP3 Toolkit is the solution to your needs. It rips CD files into generally compatible formats, so that the most precious music is preserved and listened to. Ensures utmost security. Apart from its undeniable utility, MP3 Toolkit is easily the best among its competition because of the premium it gives on security. It is 100% safe, as guaranteed by more than 60 Anti-Virus products. You are definitely free from worries trusting this with your most precious content! Absolutely user-friendly. Trying new software for audio editing can be a dragging, especially for busy people. Good thing, MP3 Toolkit offers tutorial for new users to learn the basics. All they need to do is to visit the website and search for the how-to’s of utilizing particular functions. What are you waiting for? Trying out this software is a no-brainer! Go on and download it now!